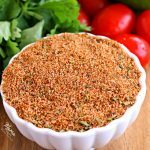 Easy homemade taco seasoning made straight from the spices in your pantry. Naturally gluten-free and perfect for those following the Paleo or Whole30 Diet. Add all of the ingredients in a small bowl and stir to combine. If only using half of the taco seasoning, store in an air-tight container or zip lock bag. Taco Seasoning is for 2 pounds of ground meat. Mama says, "check all of your of labels!"